40k is grimdark, but Bonkles are noblebright. Seriously, 40k is war, bonkles are lone heroes fighting stuff. Here's a Dark Angels librarian on bike I did earlier this year. One of the few things I've gone all-in on and finished lately. So is nobody excited for space hulk deathwing? I mean, sure, it's just 40k DOOM, but hey, that's cool. Plus, you get to play as a librarian. If nobody else thinks that's awesome, I feel sad. Funnily enough, I saw a Blood Angel on a book cover and thought he looked like Tahu, which spiraled into me getting into Warhammer 40k lore, than the games, and am now easing into the tabletop game (First Purchase: Death Company, hope to prepare for my first batrep relatively moderately while in college). I really like the Blood Angels, but I'm also interested in Eldar, Imperial Guard, and Tau. I am really excited for Space Hulk: Deathwing, but I try to tone it down just in case (Although, likening in to Doom made me more excited), and I have been enjoying Deathwatch: Tyranid Invasion on IOS to fill the void made by the fact that I desire but do not own Space Marine or any Dawn of War. I get the impression that the fanbase is really nice and willing to help newbies (myself included) and I hope that, with the help from others, I can be better at things like painting models, building armies, and what to do in actual batreps. Anyways, I really like Warhammer 40k, especially its story, its fanbase, and the games, both tabletop and video games, and it all started with me thinking a Blood Angel looked like Tahu. I feel its unorthodox but appropriate at the same time. My involvement with warhammer first began when I went to a comic book store and saw a setup with a tyranid mawloc in the window. I stared at the painted model for a while, excited beyond belief by just how cool it looked. I then went inside and impulsively bought a squad of tactical marines, hormagaunts, genestealers, necron warriors, and a necron barge. On the way home, I was sad to discover that I needed clippers, paints, and brushes. When I had to move to china later that year, I had to give the models away. While in China I decided to check up on warhammer again. This time, it was fantasy that caught my eye- thanks to the end times and the warhammer starter set, which started my skaven collection. When the tau models got their new color scheme, I suddenly took interest in them. After all, the white, red and black color scheme was far more flattering than their previous ochre scheme, which I hated. Now, I have a tau army, but I'm SUPER interested in the new genestealer cults army. I also now play age of sigmar, which I can testify is very fun to play thanks to its new points values. So, anyone seen this yet? I just watched that after posting, it's awesome watching the process, however, I do think a man-sized chainsword would've been a bit better (in comparison to the Space Marine chainsword they made). I appreciate the amount of work they put in, however, and its awesome that an actual chainsword is plausible. Yeah, a smaller, more wieldy one would have been nice to see, but good luck find a chainsaw motor at that size that still works well enough. Yeah. So, I've been looking at Imperial Guard Regiments and I really like the look of the Death Korps. They're like a mix between the Great War and Warhammer 40k. 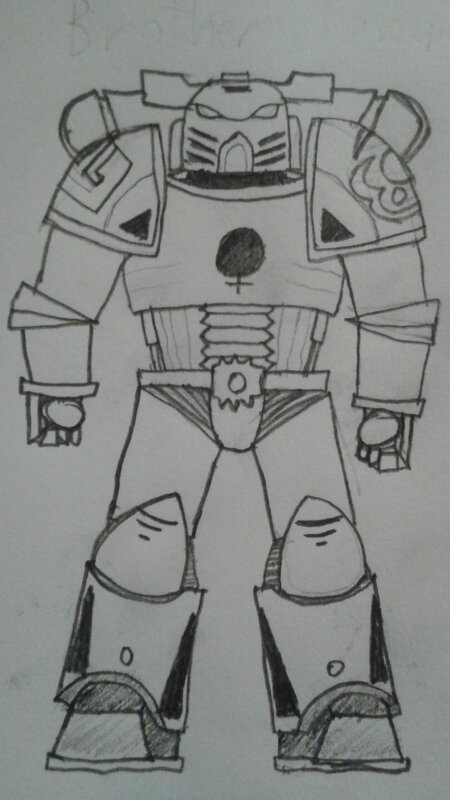 I feel it is only necessary I post a drawing I did of Tahu as a Loyalist Space Marine. In any case, is anyone else excited for Eternal Crusade, or am I the only one giving that game a chance? Eh, I'd rather save up for Dawn of War, I don't know if I should get the first one with mods or the second one with mods. Eternal Crusade was a lot of broken promises (including FtP Orks and Planetside-esque world) and doesn't seem that good compared to what was promised. 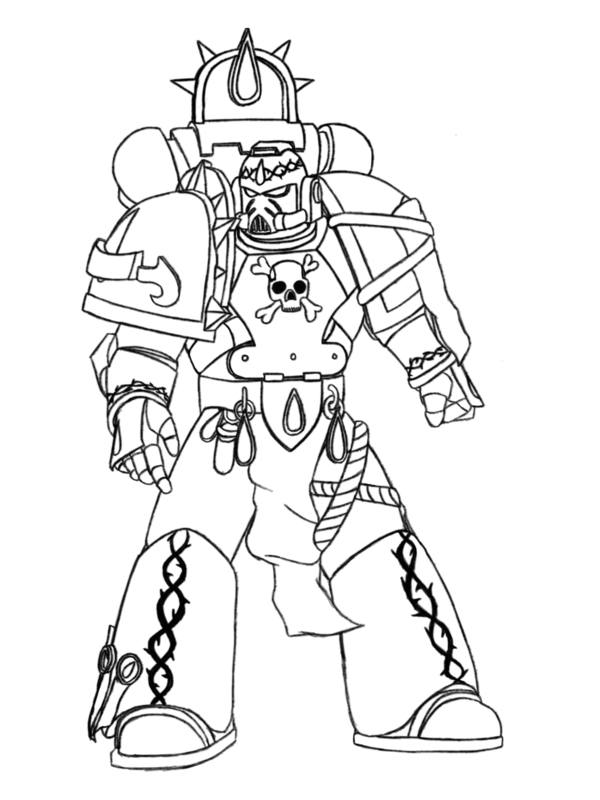 Also, I've been working on my own drawing of a character named Caelestis, a Veteran Sergeant in one of the succesor chapters of the Blood Angels, the Angels Penitent (An underrated chapter imo). I might change his armor and his rank to Captain, however. While I agree that it isn't anything near what was promised, they were promising an absurd amount, and they still intend to get around to doing most of the things they promised. If anyone is at fault, it's Bandai for shoving the game out early. What it is in its current state is a very fun lobby shooter with a good teamwork dynamic, with some surprisingly good PvE modes as well. I think it's worth waiting on, but not giving up on.